"The Optoma EH505 projectors were chosen for their great quality and the short throw which limits the amount of shadows cast by visitors. The result is a spectacular and fully immersive display that generates an emotional, meaningful journey into the world of fine chocolate ". The walls that the content projects onto measure 2.6m in height by 7m width. Задача: The Cité du Chocolat Valrhona, the source of fine chocolate, wanted to entice and heighten the senses of visitors into its world of chocolate craft production through a visually immersive room. Решение: Videmus installed 5x EH505 bright and lightweight ProScene projectors with short throw lenses to project content onto three walls simultaneously. Результаты: This new space plunges visitors into the everyday life of the ‘craftsmen of ultimate indulgence’. It unveils the exciting universe of artisanal production of fine chocolate. Located in downtown Tain l'Hermitage, the Valrhona Chocolate City is a unique space for interactive and multi-sensory discovery. It was created after much demand by many to visit the Valrhona chocolate factory, established over 90 years ago. The scenography of this space was developed after discovering ways for visitors to have a more interactive experience, and to heighten their five senses using different animations. An expansion was planned at the beginning of 2016 to invite visitors to dive deeper into the world of fine chocolate. An entire new floor was purpose-built to facilitate various interactive multimedia devices. The museum wanted to create an impressive immersive space, allowing visitors to absorb the daily life of these ‘craftsmen of indulgence’. Thus, a projection space was designed covering three walls with an impressive resolution to allow chocolate lovers to be even more immersed in this beautiful city of chocolate. 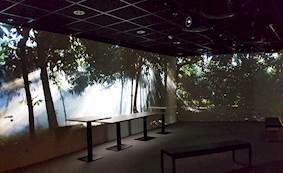 Three walls of the immersive room were projected onto. The entire space measuring 21 square metres. 2.6 metres high by 7 metres wide with the other two walls measuring 4 metres wide. Integrators, Videmus installed five Optoma ProScene EH505 projectors with short throw lenses. This projector model was capable of delivering stunning image quality with 5000 lumens. Easy to install with a short throw lens, it was the perfect installation solution for this type of demanding application. The full HD 1080p resolution enhanced the visual content of the chocolate city in rich colourful images. With a filter-free dustproof design, operation is constant, reliable and undisturbed resulting in reduced maintenance costs and minimal downtime. The wide range of optional focal length lenses, zoom and focus adjustment provided the required image size, and the large lens shift allowed for a simple install enabling the image to be positioned perfectly. Installing the EH505 projectors with a short throw lens was ideal for this type of edge-blending projection, avoiding any shadows on the screen by visitors, and allowing a greater immersive experience for chocolate lovers. Watchout Quad servers were used as the source devices. The reliability of the EH505 allowed a perfect installation for this type of edge-blending. 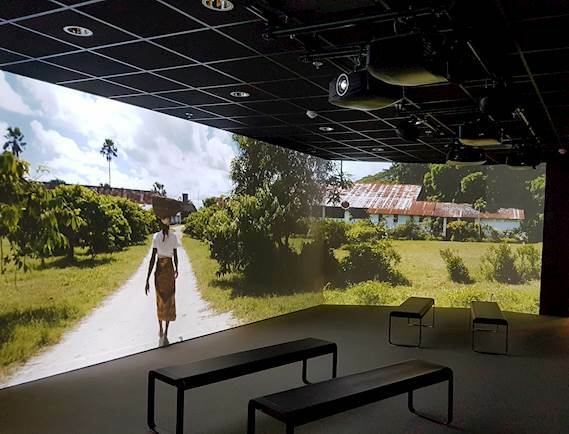 Benoit Dauvergne, of Videmus said "The Optoma EH505 projectors were chosen for their great quality and the short throw which limits the amount of shadows cast by visitors. The result is a spectacular and fully immersive display that generates an emotional, meaningful journey into the world of fine chocolate ". The entire new floor expansion was built in June 2016 to a high finish with the immersive panoramic cinema room in very high resolution as the ‘pièce de résistance’. The floor is transformed into an immersive room for up to 30 people. 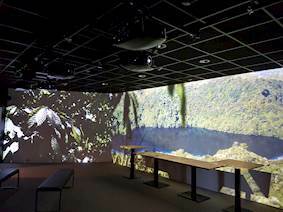 A film is projected onto three walls; it virtually recreates nature on the island of Madagascar where cocoa trees are grown. The resolution of the entire blended projection amounts to 7500 pixels.